Echipa AVmall incearca sa mentina acuratetea informatiilor din acesta prezentare. Cu toate acestea, in anumite cazuri, pot aparea mici inadvertente pentru a caror semnalare va suntem recunoscatori. Ne poti contacta oricand pentru a clarifica eventuale nelamuriri. Nu uita sa mentionezi in corespondenta ta numele exact al produsul. Fotografia produsului Procesor Digital miniDSP OpenDRC-DA8 Room Correction are caracter informativ si poate sa difere de produsul real sau sa contina accesorii neincluse in pachetul standard al produsului. Specificatiile tehnice pot contine erori de operare si pot fi schimbate fara instiintare prealabila de catre producator, neconstituind obligativitate contractuala. Floating point room correction DSP with SPDIF input, 8 analog OUT. Boxed in sturdy aluminum enclosure. 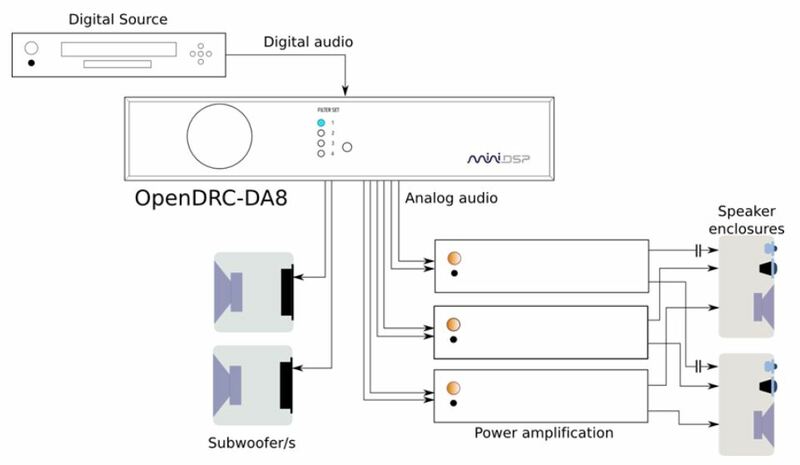 The OpenDRC-DA8 also performs as a DAC with its digital input (SPDIF) to analog outputs. Thanks to the on-board Asynchronous Sample Rate Converter (ASRC), digital audio is converted to the proper rate. 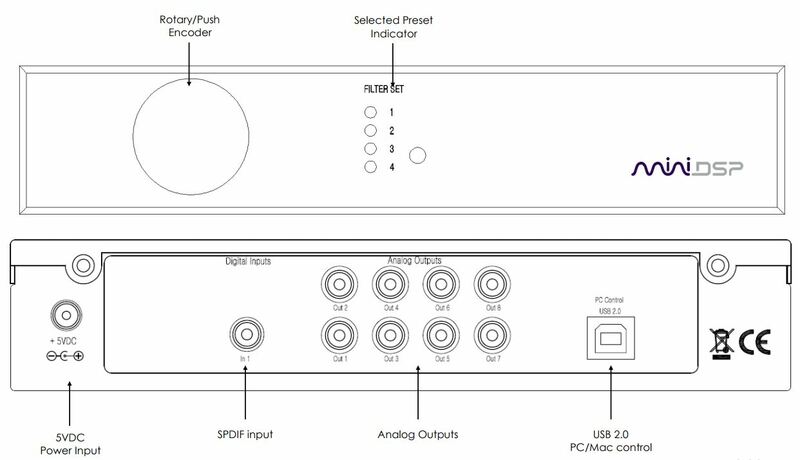 On the output side, an AKM 8channel DAC provides unbalanced audio on RCA. The learning remote feature and/or rotary encoder will allow control of the active preset or master volume without the need of any PC once the unit is configured. Last but not least, the OpenDRC-DA8 follows the footstep of our proven miniDSP concept: “One hardware, many plug-ins”. An easy to use platform that received praises for its simplicity of use. Leverage a large community of 3rd party and take it one step further in harnessing DSP powers for your projects. From advanced room correction to full featured linear phase crossover, the OpenDRC opens up a new range of audio processing solutions! A computer is only required for the initial configuration. Template FIR filter capabilities (Important note: FIR capabilities are controlled by the plug-in used and not the hardware itself). Please consult the plug-in specs for more info. Nu sunt recenzii pentru Procesor Digital miniDSP OpenDRC-DA8 Room Correction. Fii primul care scrie una!